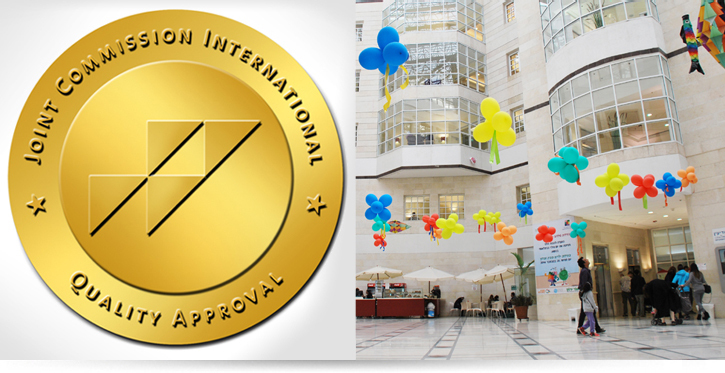 The prestigious accreditation accorded to hospitals worldwide for quality and medical safety by JCI (Joint Commission International) was awarded to Schneider Children's Medical Center in March 2016 for the second consecutive time. The accreditation "Registered for Quality and Safety" recognizes that all activities are conducted safely and in coordination, according to regulations and the latest scientific knowledge available today in the field. The overall mark achieved by the hospital was 98.78%, with a complete score without any commentaries for standards, patient safety, and quality of care and research, which are all pillars of the hospital. This is the second consecutive time that Schneider Children’s has been awarded this prestigious accreditation, having received it for the first time in 2013 which it was also deemed an academic institution. The process of attaining the valuable accreditation is long and complicated and took about three years. As Schneider Children's is a pediatric hospital, installations and various processes had to be extensively adapted for the treatment and care of children and their families. Every process at Schneider Children's was adapted from a general hospital - from the electrical sockets and medication distribution regulations to maximum efficacy of quality of care and patient safety. The inspection, designed for general hospitals, required adaptation for a pediatric hospital. Schneider Children’s was evaluated as an academic institution and as such, its research activities including its affiliation to a university and the synchronization between the standard medical course and applied clinical work. In addition, communication efficiency and the sharing of knowledge among staff was also evaluated in order to test the effectiveness of the work program. JCI is the largest and oldest organization in the world that accords recognition for quality and safety to over 16,000 health organizations in the United States. Since 1965, it has served as the gold standard for American hospitals (about 85%) and examines the strict standards set by the government's health scheme in the US (Medicare and Medicaid). JCI is active in more than 30 countries in the world. Clalit Health Services's hospitals are the first and only institutions in the country which undertook this obligation to quality and safety. The model followed by Schneider Children's management was based on 13 strict standards regarding comprehensive quality of care, patient safety, organizational efficiency, and interteam communication. During the 5-day evaluation by a team of international inspectors, about 1,300 sections were examined such as rules for communicating with non-Hebrew speaking patients, use of medications within hospital departments, management of surgical and anesthesia processes, management of safety methods to reduce acquired infections, regulations to prevent injuries to staff and patients inside the hospital, and more. The management of Schneider Children's undertook the responsibility to undergo the long and difficult process of accreditation to substantiate its having met international standards. The fruitful cooperation between multidisciplinary teams, characterizing the hospital on a daily basis, added to the impressive results. The JCI inspectors noted at the end of the week that they were satisfied with the outstanding functioning of the hospital. One of the inspectors said that if his child needed medical care, he would want to refer him to Schneider Children’s, while another added that he was pleased to have been one of the investigators at Schneider Children’s. Prof. Joseph Press, Director of Schneider Children's, said that "the Management of Schneider Children's and myself are proud and excited to receive this prestigious international academic accreditation. The inspection represents further proof of the unique human and professional capability of our staff. We at Schneider Children’s are accountable for the hundreds of thousands of children in our care every year, and we must continue to advance pediatrics in Israel and ensure that every complex treatment conducted in the hospital will be carried out with maximum patient safety."